When it comes to large families, there is one thing for certain; there are going to be lots of chores to go around. If parents have four or five kids, the amount of chores and who is going to do them can get quite hectic at times. 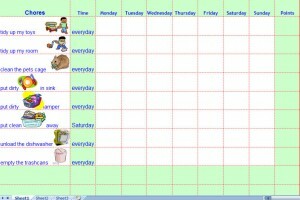 That is why one of the things that a parent should obtain is a free chore chart Excel template. Parents having such a chart will be able to keep track of what child is doing what chore. This template will help both the parents and kids develop a routine that is good for both of them.